Carhartt quilt-lined duck coverall is designed to last. 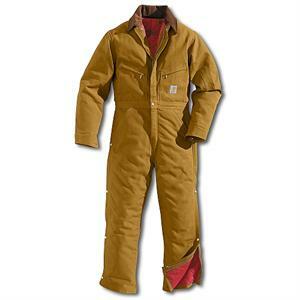 It is made of 12-ounce, firm-hand, 100% ring-spun cotton duck with a 100% nylon quilted lining. It features multiple tool and utility pockets, hammer loop, corduroy top collar with snaps under collar for an optional hood, ankle-to-waist, two-way leg zippers with protective wind flaps and snap closures, split back with bi-swing for comfort and pencil slots on left sleeve. Main seams are triple-stitched for durability.